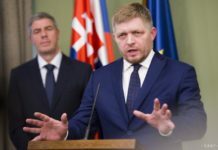 Stara Bystrica, July 16 (TASR) – Slovak Prime Minister Robert Fico on Saturday (July 15) roller skated the cycling path called ‚Bystricka cyklomagistrala‘ as part of marking the 25th anniversary of the Declaration of the Slovak Republic’s Independence in the village of Stara Bystrica (Zilina region), TASR learnt on Sunday. „For those who like roller skating, there’s no more beautiful feeling than that when you’re passing a river or a stream. 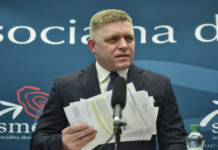 When you have meadows on the right and forests on the left, it’s a relaxation that can’t be found everywhere,“ said Fico, adding that he can be easily talked into this kind of activity. Banska Bystrica mayor Jan Podmanicky stated that the core of Bystricka cyklomagistrala is 25 kilometres long and leads from the town of Krasna nad Kysucou to the end of Nova Bystrica (both Zilina region). He added that the cycling path offers magnificent views of the Kysucke Beskydy Mountains, the Mala Fatra Mountains and Poland. The path has an easy level of difficulty, so it’s suitable for families with children as well, said Podmanicky. The prime minister noted that during the discussions on which projects could be funded following the planned easing of the debt brake the talks also included cycling paths. „I don’t think that these projects [cycling paths] are so demanding in terms of investments that they should be included in the list of infrastructure projects that would be funded if the debt brake is loosened,“ said Fico. „Zilina region is known for being probably the most effective region in terms of drawing EU funds. That can be seen on various projects. 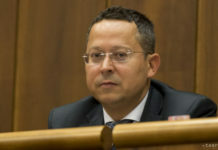 And if it happens that the region wants some help for building a cycling route between Zilina and Martin, I’m absolutely ready,“ he added, noting that these are the projects people are really interested in.